Highbush cranberry is one of those plant names that, as an amateur botanist, fills me with a number of conflicting but equally reasonable emotions. It is one of those names that when taken in a literal context appears to be bewilderingly inaccurate and deliberately misleading but when observed under a different connotation is filled with a cultural charm that reveals much about the way we perceive and relate to the world, and perhaps even more importantly, how we communicate our understanding of that world to others. It’s funny how much one can learn from plants, even just by looking into the deeper meanings behind why they are called what they are called. We all benefit from attempting to simplify communication in order to limit misunderstandings or misinterpretations, but this only works up to a certain point. Inevitably, information can become skewed and it’s true meaning botched, especially if a single piece of information has exchanged many hands. This is in some ways the case with the highbush cranberry, Viburnum opulus. This species is by no means closely related to cranberries (subgenus Oxycoccus of the genus Vaccinium, for the nerds) although the name ‘highbush’ does seem to fit as V. opulus it is indeed a shrub or small tree, often with many congested trunks or stems emerging from a central root mass. The name ‘cranberry’ was likely given to this shrub after it’s fruit which resemble cranberries in overall appearance. However, cranberries (almost as closely related to blueberries as one can get) are produced by small, creeping subshrubs which grow along the ground instead of above it in poorly drained, acidic environments which often have low levels of nitrogen and other essential nutrients. So from a botanical and behavioral perspective it is quite clear that these two species, although their names may imply a close association, are similar only in terms of the physical appearance of their fruit. 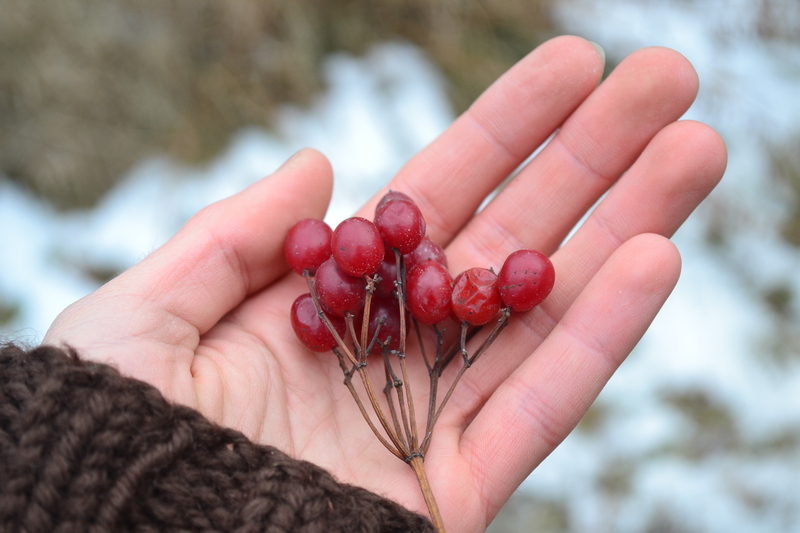 Highbush cranberries (pictured above and below) are one of the few wild fruits that one has access to during the winter months, and it is perhaps the only one which tastes better after it has been left hanging on the shrub exposed to the winter chills for 2 or 3 months. Highbush cranberry fruit, which grows in dense hanging clusters from the ends of twigs following exceptionally showy flowers, turns from greenish yellow to various states of yellow through to bright red as it ripens. In mid-late Autumn (October to November usually) the berries have become plump and soft and full of juice. Although they look like they are ready and that their taste would be exceptionally sweet, their flavor is, shall I say rather unique. Some have described the flavor as foul, stinky and akin to sweat or dirty socks. I’m not sure if I would agree with any of these statements, mainly because the taste is much more complex than that, and is beyond comparison with anything else that I have ever tried, although I must admit that I have not bitten into a dirty sock and so perhaps I am just being ignorant. I personally do not mind the flavor, especially when enjoying them mid-winter as by then the freezing and thawing that the berries have endured has helped to predigest and ferment the sugars in the fruit, helping to improve and sweeten their flavor somewhat. In the autumn the flavor is even a bit too strong for me, however I will still enjoy a few nonetheless just because I can’t give up the temptation. Lately I have been returning to the same local shrub which I have been collecting a few days worth of berries at a time and enjoying them fresh with breakfast. Keeping this in mind, as semi-skilled wild foods forager I may have a bit more of a hardier palate than most but I encourage you to try these berries anyhow and make up your mind yourself. Despite all this I have one last thing to say in defense of highbush cranberries (especially if you find yourself in the position of deciding that you don’t like their flavor), that being that they are extremely good for you, especially during the winter when fresh local fruit is practically impossible to find in Canada or the northern U.S.A. A study that I came across right here has this to say: “Highbush cranberries are a rich source of anti-oxidants, a group of biochemicals shown to be an important part of the human diet. Research with fruits shows cultivated blueberries with a score of 24, which is higher than other commercial fruits studied. Anything above 40 is considered very high. Highbush cranberries score much higher at 174.” The same article goes on to say that a 1/2 cup serving of highbush cranberry fruit provides 20% RDA (recommended daily allowance) of vitamin A, 25% RDA of vitamin C and 28% RDA of dietary fiber with only 60 calories. With that being said, hopefully all of you are now pumped to get out there and find yourself your own sustainable, local source of fruit to tide you over until you can coax the first fruit out of your garden or you buy your first basket of strawberries at the farmer’s market. So what’s next? It might help a little bit to know a few things more about what this plant looks like and where in particular you may be able to find it growing (incoming geek warning). For starters, there is a bit of unsolved taxonomy at work within this species, which is something that you may come across if you choose to research this plant more on your own time. Some refer to the highbush cranberry as a species complex, which is a loose term that generally refers to numerous closely related species whose status as individual species is not officially agreed upon from a scientific standpoint. 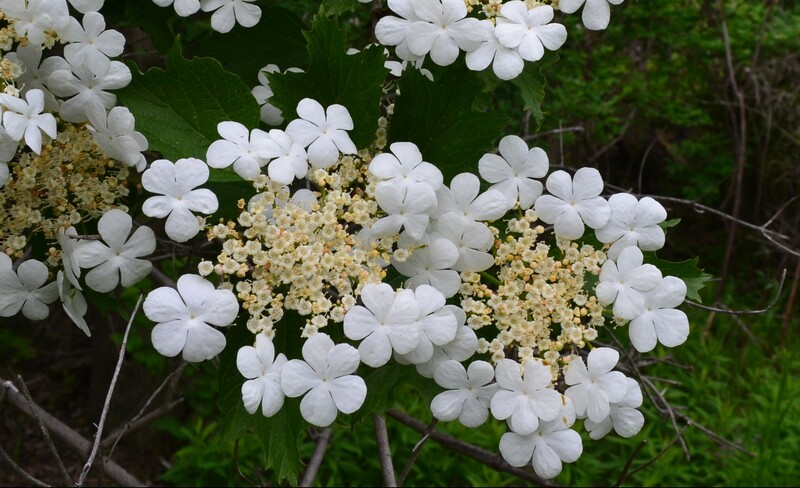 Specifically, in North America there is a very similar plant that some refer to as Viburnum trilobum or V. opulus var. 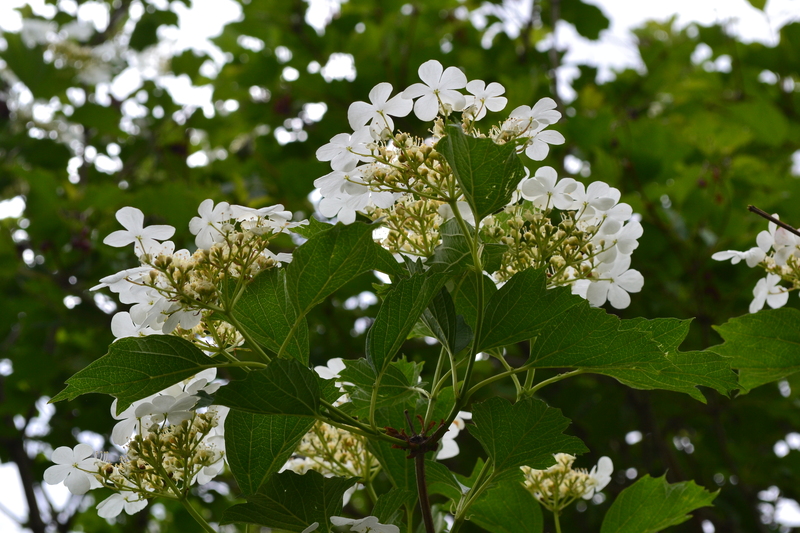 (variety) americana which is regarded as a native species in addition to the introduced and naturalized V. opulus, which in Europe is often referred as the guelder rose. The problem here is that there is no consensus on the subject and consequently there are wildly different opinions held by both individuals, scientists and research institutions alike as to the relationship between the two plants. Some botanists affectionately refer to individuals on different sides of such arguments regarding the classification of species as either lumpers (those who prefer to treat closely related species which can’t be proven to be different enough as one highly variable polymorphic species) or splitters (those who believe in separating and designating subspecies or varieties to specimens/populations of similar organisms dependent on various genetic or geographic factors). Despite the fact that both V. opulus and V. trilobum and/or V. opulus var. americana (confused yet?) have been geographically isolated from each other via the Atlantic Ocean for hundreds of thousands of years, their physiology has not changed as much as it has with other closely related species that once occurred in both Europe and North America before the continents began to separate. This is perhaps what makes the debate so heated; that even though it took the human species to reunite these ‘species’ together and they have been separated for so long, there are only a few small glands at the base of each leaf and a couple of other more arbitrary observations (overall leaf shape etc.) that individuals and scientists have in order to make their educated guesses as to how to treat the relationship between these two plants. Some sources state that the European ‘species’ grows taller and is more adaptable in terms of suitable habitat and tolerance of urban conditions, and this is a claim that I attempt to neither prove nor disprove. Interestingly enough, and to add to the overall madness, the ‘species’ that originated in Europe was introduced to North America as a garden ornamental and has subsequently escaped into the environment and formed self-perpetuating feral populations to the point of arguably being more common near cities than the native ‘species’ of highbush cranberry. Now this is all very convoluted and subjective, even for someone like myself who occasionally enjoys immersing themselves in this sort of scientific debate (or educated nonsense if you prefer to call it that). In light of all this, in the eyes of the forager and gardener, none of this really matters, considering both ‘species’ (whether they are separate or one is a variety of the other etc.) have edible berries and more or less look exactly the same to all but those who may know exactly what they are looking for. Some authors state that the North American highbush cranberry tastes better, but I have not observed on my own anything to prove this claim and so am inclined to believe that it’s legitimacy is partly questionable. Either way, a high bush cranberry is a highbush cranberry and they both taste sour and a little bit stinky. 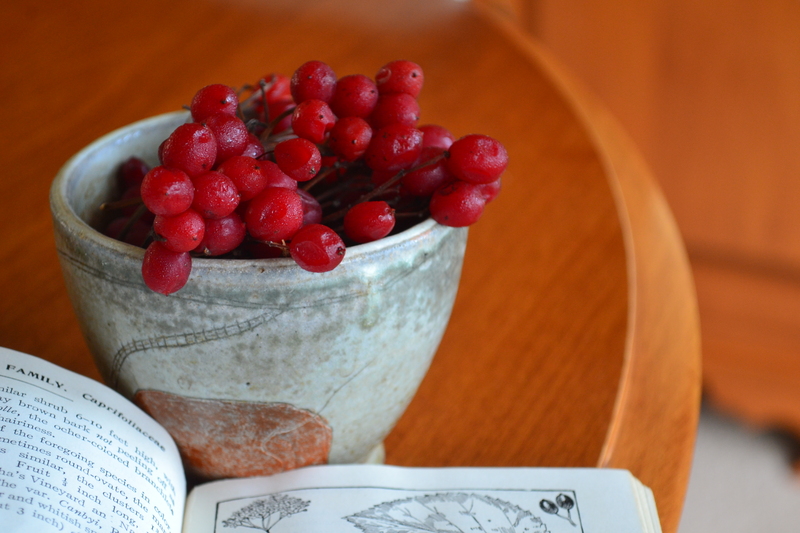 So what does a highbush cranberry look like? The shrubs are usually about as wide as they are tall and tend to grow along the edges of forests, in moist meadows, on gravelly embankments or rocky screes, along streams, fence rows, in thickets or on lake shores or the edges of marshes. They can tolerate a little bit of shade, but grow most luxuriantly and fruit the heaviest when growing in full sun. Individuals usually start flowering and bearing fruit when they are around 5 years old and will fruit for many decades. The flowers are produced in either May or June on the ends of the current season’s growth, which sports pairs of smooth, simple leaves divided into 3 broad lobes each with several coarse teeth with ‘U’ shaped sinuses between them. Fruit is bright red when fully ripe and contains a single, pale, flattened seed. For more information on identification, please consult a (preferably a few) reputable field guides although in general this is not a very difficult species to learn to identify and doesn’t have any poisonous plants that closely resemble it. There’s even some good news for those of you out there that might not be sold on the flavor just yet (especially after that enthralling rant on plant taxonomy a few paragraphs back). Like most other berries, they lend themselves very well to being juiced or made into jams, jellies, pies, chutneys and other preserves. Highbush cranberries lend very well to being cooked and can be mixed with sugar, honey, vinegar, sweeter fruit or savory spices in order to off-set or disguise their unusual flavor and replace it with something a little more palatable. I have only ever eaten the berries fresh, but if I were to preserve or ferment then in some fashion I would be inclined to try to preserve their interesting flavor, at least just a little bit. Enjoying the fruit of this enchanting and surprisingly poorly understood plant is a unique experience in the understanding of flavors; allowing you to question the preconceived boundaries of what you previously considered to be pleasurable to eat. Yes, they’re strange and maybe even a little off-putting at first, but they’re just one more why to experience and appreciate firsthand the dynamic expressions of nature.